Judy Bayley was born in Dallas, Texas, in 1915 to Fred and Ada Belk. From her earliest days, she showed a flair for entertaining, showing early talents in dancing and performing. She attended Southern Methodist University, where she graduated with a double major in music and English. In 1936, she married Warren “Doc” Bayley, the owner and operator of a chain of California hotels. The Bayleys came to Las Vegas in 1953 to begin expanding their chain into the growing casino business on the Strip. They opened the Hacienda Hotel in 1956 and the casino in 1957. After Doc’s death in 1964, Judy became the first woman in Nevada history to be the sole owner and operator of a hotel-casino. From 1964 until her death in 1971 Judy returned the Hacienda to profitability despite having no formal business training. Her early tendency toward entertaining influenced her business strategy. She recognized the need for publicity to drive business at the Hacienda, so she actively worked to keep herself and her hotel in the media spotlight. Thanks to these promotional efforts, she was affectionately known worldwide as the “First Lady of Gambling.” She was also very hands on in the casino’s operation, overseeing the addition of Keno, Poker, and Pan to the gaming operations, working closely with the restaurant and entertainment staff, and even designing a new sign for the Hacienda. Her hands on approach and affable demeanor inspired great loyalty among the Hacienda staff. Bayley was also a great philanthropist, committed to raising money to fight cancer and heart disease and to help children in need. She used the Hacienda showroom to host the city’s first Heart Fund Telethon, and contributed to subsequent telethons. 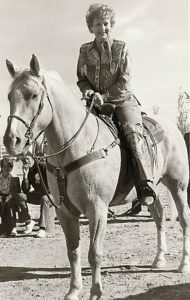 She sponsored the very popular Hacienda Trailride, a fundraising event that benefited the Veterans of Foreign Wars, the American Cancer Society, and other charitable organizations. She gave funds to UNLV during an important period of its growth. In 1971, she became active in the fundraising effort to finance a new performing arts center, donating $65,000 in seed money for the project. The theatre was completed just after her death and named in honor of her many contributions to Las Vegas and the university. Sources: Eugene Moehring, UNLV: A History, (Reno: University of Nevada Press, 2007); Women’s Research Institute of Nevada, “Judy Bayley,” unpublished article. Nevada Men and Women of Achievement, 1966. Richard Taylor, Las Vegas Hacienda Hotel History, vol. II, 1997. “Judy Bayley dead at 56,” Las Vegas Review-Journal, December 31, 1971, 1.